This forum will explore the latest legal and contractual innovations for promoting corporate social responsibility, from cutting-edge company and community practices to new or emerging laws and standards. Leading scholars, practitioners, and in-house counsel will consider new contractual devices for achieving labor and environmental standards in global supply chains; local fracking ordinances, Good Neighbor Agreements, and other ways that local communities are influencing corporate behavior; newly-imposed obligations for companies to disclose environmental and social risks; and international treaties and standards that are increasingly shaping domestic laws and corporate policies. This post includes the Conference Program and some observations on the presentations below. David B. Spence, Professor of Law, Politics & Regulation, University of Texas School of Law and McCombs School of Business—Corporate Social Responsibility in the Shale Patch? George Foster started with an introduction setting the stage for the materials to come. He started by considering the way that the terms CSR is used and pointed to the general sense of its meaning. He emphasized the focus on both the "social" and the "responsibility" in CSR irrespective of its role in formal law systems. The object, then, is to manage behavior norms for business in its responsibility in the societal sphere, whether or not regulated by states through law. The objects are behaviors not law. What objects? These can include labor abuses and supply chains, conflict minerals, fracking, the protection of indigenous groups, and the transnationalization of CSR in those governance gap zones where national law finds it difficult to reach. Session I—Self-Regulation: Labor and Environmental Standards in Global Supply Chains. Richard B. Stewart, John Edward Sexton Professor of Law and Director, Frank J. Guarini Center on Environmental, Energy, and Land Use Law, New York University School of Law—Strategies for Regulating Greenhouse Gas Emissions in Global Supply Chains. Speaking to voluntary corporate greenhouse gas (GHG) regulatory programs and the challenges for their implementation within supply chains, with respect to their structuring as freestanding programs or as part of corporate sustainability programs, and the lack of data on corporate regulatory programs sufficient to consider strategies more effectively. Look to the programs at the large multinationals (Walmart, Microsoft, Apple, BP, Hyundai)) and focus on freestanding programs. He focused on supply chain management and GHG. He noted the challenges of the Paris Climate Agreement--insufficient ambition and source based regulation coupled with a weakness of developing countries to implement their own programs. The resolution of these challenges--internationalization and voluntary GHG regulation (linkage and dominant market actor strategies). Basic elements of programs are built around three areas: monitoring, regulatory instruments, and incentives for compliance. The challenges follow: incoherence in diversity of regulatory programs, variation in monitoring and accountability systems and compliance programs. These, of course, are similar to issues of self regulatory programs in a societal sphere around but not subject to single sets of standards. He then made the business case for GHG programs. He ended with a detailed explanation of the menu of issues that must be solved to produce viable and effective private sector programs. He noted that though the business community (along with NGOs and local governments) were excluded from the Paris negotiation these GHG programs might prove a good means creating robust governance beyond the state but in conjunction with states. Margaret Chon, Donald and Lynda Horowitz Professor for the Pursuit of Justice, Seattle University School of Law—Private Goodwill and Public Goods: Brands in Global Value Networks. Professor Chon spoke to trademark goodwill as a public good, on brands and innovation in CSR. She explored three points: (1) law and policy of trademark and of supply chains have failed to talk to each other, (2) trademark goodwill may be a good place to start, with brands functioning as platforms; and (3) there are huge benefits in doing so. Trademarks are systems of regulatory governance--systematic efforts to regulate business conduct through exercise of non state authority--what is also known as governance in the societal sphere. Certification programs perform these functions. Brand citizenship serves societal differentiation among consumers and producers. They are market enhancing and demand satisfying to the extent they meet these hierarchy and status producing elements of consumption beyond satisfaction of physical need (but one wrries about the collateral effects of consumerism and consumption exploitation strengthening class stratification). Tracermarks have become important (for example in Washington's marijuana business regulation)--tracing sourcing in supply chains (GMA and Whole Foods). Trademarks signal and distinguish among products. Balance protection of consumers and firm goodwill traditionally. She pointed to cognitive capitalism--co creation of value form interaction among brands and consumers (iterative dialogic process) or as has been noted elsewhere markets as democratic processes. Consumers will add or subtract value to brands by voting with their dollars, boycotts, NGO interactions, etc. (my earlier complementary view here). Transparency is essential. But she notes that the reality is different than the ideal especially where supply chains are complex and trustworthy information is difficult to get and process. Can trademarks make a difference? That is the basic question then posed. Expanded to include trust functions: sourcing and trace ability for example. Brands as rule makers, receivers and as objects of outside certifers. Challenge is the capture of brands by marketing departments--it needs to be reclaimed by the CSR managers in TNCs. Joshua Simko, Senior Counsel, Supply Chain and Enterprise Contract Management, Nike, Inc.—Nike’s Supply Chain: Sustainable Innovation and Corporate Responsibility as an Engine for Growth. On the ground look at what Nike is doing in supply chain related CSR. Assume that people want to do the Right thing; Nike by serving its consumers with quality protects in a sustainable way. New campaign--"double our business with half the impact." He noted the context of global risk and opportunity in supply chains and the business challenges it poses. Nike seeks to use these challenges and constraints as "a powerful engine for growth" by minimizing their environmental footprint, and by transforming manufacturing in ways that are environmentally and socially responsible. Recalled a history in which Nike moved away from formal defensiveness ("we don't own our downstream suppliers"( to embracing CSR in their own way by creating sustainability as an additional business unit alongside supply chain innovaiton, footwear, apparel, and categories. Then moved sustainability from merely focused on compliance to "project greenwire" layering sustainability across all business units--embedding sustainability in their own target goals. Constraints for this project: control issues over suppliers (and underlying issue of legal liability versus societal liability). Workarounds--make sustainability choices upstream and cram them down-- control of materials (for sustainability), sustainability indices for product designers at corporate level (the "making app" at Nike, and energy consumption goals. To incentivize third parties Nike incorporates standards in contracts (with shipping companies)--a good example of privatized governance. More difficult where Nike sources at a place subject to multiple private governance codes--coherence in standards and implementation. Nike uses its own Code of Conduct (my discussion of these codes eg here) augmented by sources index in which sourcing factories are assessed against each other and the overall standards. The higher the performance the more business--and they provide technical assistance (a world bank model approach), and indeed NIKe is now working with IFC on these programs. Yet Nike continues to view its assessment as proprietary information and seeks to operate in sustainability in a way that minimizes the legal effects for liability. David B. Spence, Professor of Law, Politics & Regulation, University of Texas School of Law and McCombs School of Business—Corporate Social Responsibility in the Shale Patch? Professor Spence looked at CSR in the shale industry--a look that yielded far more than he thought might have existed. Consider CSR as a societal (CSR as social license) rather than as a legal requirement (legally required conduct is considered compliance and not considered here). He starts with the oil curse--the resource rich states doing poorly in the midst of vast resource wealth. He noted the rich literature in the area. He first considers CSR investment among the "supermajors"--Shell, ExxonMobil and Chevron. Programs start to look alike--safety, environmental protection, human rights issues, local development, training up. Work in lock step to embed themselves in the internationalized standards developed by public and private norm makers. Has this approach to CSR followed into the shale industry in the United States. Oil curse appears to follow in the United States with local governments seeking to regulate more stringently than the states--with the courts siding with states (except to some extent in NY and PA). What do do with the environmental challenges of fracking (water related, seismic, air pollution and local quality of life)? Unlike in oil, the apex companies are major but not supermajors ($1-10 billion revenues)--resources for CSR investments are more modest. Focus on infrastructure (roads and firefighting), education and training (STEM), and local socioeconomic (hospitals and schools, local content, corporate philanthropy). In my own work I note that these are the sort of conservative efforts that Chinese companies have focused on in their own CSR efforts. The difference is there is little work in environmental impact on the part of companies in the U.S. Professor Spence then notes the difference between CSR in the shale patch and CSR overseas: differences in challenges to reputation risk (higher and more direct overseas, for shale production it is diffuse); bargaining and informal leveraging (greater bargaining leverage overseas than for the local communities in the US); and public misperceptions (of regulatory capacity/diligence and of real risks to the community, steering public pressure in other directions). Albert C. Lin, Professor of Law, University of California, Davis, School of Law—Community Levers for Benefit Sharing. Professor Lin explores sources of community leverage, picking up from one of the challenges for local communities mentioned by Professor Spence with respect to shale sector CSR. Benefit sharing include mitigation measures provided to local communities affected by local projects--either to mitigate loss or sharing benefits. Fits into CSR by (1) doing beyond what the law requires, (2) beyond voluntariness, (3) stakeholder enhancing for more efficient operations. Sources of leverage--zoning (to the extent not constrained by constitutional limits and state law), private tort claims (negligence, nuisance, trespass, etc. with nuisance the most successful), public nuisance claims (better leverage by local state actors to attack negative externalities), public trust doctrine (property law doctrine administering property for public benefit usually narrowly applied but sometimes applied to wildlife and in California groundwater), state constitutional provisions (codifying public trust doctrines and recognize environmental rights though few hold this right enforceable (exception Montana)), processes (NEPA, state NEPAs, state permitting), and other sources (taxes and fees, international law and extralegal mechanisms (societal sector)). He then offered an example from Canada involving Impact and Benefit Agreements (IBA) between indigenous groups and companies for resource development. The challenges--asymmetrical bargaining power, negotiated after work begins so that tend to focus on mitigation rather than sharing, uneven distribution of benefits fracture communities, and the limited role of government may reduce duty of government to protect indigenous lands (privatization of responsibility). James N. Saul, Assistant Clinical Professor of Law and Staff Attorney, Earthrise Law Center, Lewis & Clark Law School—Citizen Suits and Good Neighbor Agreements.Speaking to the use of litigation as a CSR enhancing tool by local communities. A citizen suit is a suit brought against a violator of a federal environmental standard (a variant on the US private attorney general suits, for an early consideration see here). A good neighbor agreement is a contract used to obtain some sort of compliance beyond what is required by law. Citizen suits authorized by stature, provide broad remedial alternatives but also pose significant barriers (standing, mootness, ripeness, 60-90 day pre-suit notice rules (hold on litigation commencement), and diligent prosecution doctrines (e.g., here)). In the final analysis these suits are viewed as a secondary measure when the state fails in its duty. Good Neighbor Agreements not expressly governed by special stature. They are driven by perceived harm combined with lack of transparency. Usually a failure of communication issue resolved by private contract. Quick comparison: Citizen suits are driven by lawyers, more costly and time consuming but potential remedies may generate leverage. Good Neighbor Agreements are driven by community residents, negotiated directly with community leaders, are generally less time consuming and complex than litigation, and leverage may be quite modest. The Good Neighbor Agreement embeds local communities in local operations; the Citizens Suit provides the power of the courts to enforce agreements. The presentation ended with examples: NEDC/NCA v. Intel Corp. (copy of settlement agreement HERE) and Sierra Club v. PGE Boardman (copy of consent decree HERE). Celia R. Taylor, Professor of Law, University of Denver, Sturm College of Law—The Unsettled State of Compelled Corporate Disclosure Regulation After the Conflict Mineral Rule Cases. The focus is on conflict minerals compelled disclosure and the difficulty is the choice of disclosure regimes. If disclosure is made mandatory there may be substantial legal obstacle if compulsion comes form the SEC and its mandate. Professor Taylor started with a history of conflict minerals and the conflicts in the Congo through the Dodd Franck Act § 1502. The object was to help ameliorate the conflict in the Congo or adjoining state rather than to advance human rights or CSR. This objects fracture might have important consequences. Professor Taylor then went through the provisions of the Act. She noted the scope of the Act was broad because "conflict minerals" appear in many consumer products. The process of reporting was described involving a number of ambiguities and costs of compliance. A number of legal challenges were interposed. Professor Taylor focused on the challenge grounded in 1st Amendment concerns (compelled speech--e.g., that a product is conflict free). Compelled speech is protected in part where state had a rationally related interest in consumer protection (touching on purely factual and uncontroversial). Then the case of National Association of Manufacturers v. SEC (2014) was described in which heightened scrutiny was applied to compelled commercial speech through disclosure. Also American Meat Institute v. USDA (2014) where the court reached a different result. The resulting conflict of cases has made compelled disclosure risky as a legal requirement. The Conflict Minerals rules remain in place but no longer have to disclose whether the product is made with conflict free minerals. The disclosure has effectively been gutted.The result puts front and center the great policy question--is the SEC now engaging in regulating societal issues unrelated to investor protection and therefore beyond its jurisdiction under the acts it enforces? And that brings to the foreground the fundamental principle of corporate governance, shareholder primacy, versus the CSR principle fo stakeholder enhancement. Virginia Harper Ho, Associate Professor of Law, Kansas University School of Law—“Comply or Explain” and the Future of Nonfinancial Reporting. Reporting relating to investment risk and return was considered The U.S. legal environment provided the starting point. Professor Ho considered environmental, social and governance (ESG /CSR) reporting from the perspective of SEC regulation. Advanced the view that the SEC ought to adopt a comply or explain framework rather than the current narrative form of disclosure. Professor Ho suggested that such reporting forms a core part of the SEC mandate (CSR affects financial performance as a question and its own answer). It is clear form studies over a number of years that the business case for CSR has been made. In addition, CSR touches on systemic risk, especially for the use of financial disclosure to manage the regulatory environment. What is to be done? She starts from the current reporting landscape from the perspective of investors. The SEC certainly and other regulatory regimes but different companies are covered by different regulations tied to differences in regulatory mission (SEC, EPA, etc.). But bulk of information referencing ESG comes from voluntary reporting initiatives (sustainability reports). Isn't this good enough. Professor Ho thinks not. For mandatory reporting because the sources are fragmented, not linked to financial risk, and incomplete and no consensus on what ought to be reported, much less how it is to be measured. For voluntary reporting because not timely, reliable, consistent or comparable, they are costly and confusing duplicative and produce uncertainty in risk liability. Governments are putting out more guidance, however and that is a useful trend. It is to the form of that guidance--as comply or explain--that Professor Ho turned to next. Its limitations include weak explanations, jurisdictional variation, deviation more likely by smaller firms (cost of compliance issues), and deviation more likely for controversial standards. As for possibilities a number of areas were mentioned: corporate governance principles, line item disclosures (description of due diligence methods), and meta-regulation (reporting environment). James Coburn, Senior Manager, Investor Programs, Ceres—Climate Risk and Sustainability Disclosure. On the ground perspective about how to move policy. First explained the work of CERES ("Ceres mobilizes a powerful network of investors, companies and public interest groups to accelerate and expand the adoption of sustainable business practices and solutions to build a healthy global economy.") and its Roadmap for Sustainability. He spoke to CERES investor network on climate change (including World Federation of Exchanges and 2015 guidance on sustainability disclosure and listing standards). He then spoke to mega trends of global risks and opportunities: climate change, human rights and worker safety, resource depletion, and connectivity and communication. For Ceres disclosure matters because it is important for investor decision making and a critical tool for corporate accountability. Pushing for SEC disclosure as a centralizing agent. Ceres remains positive about even an anemic SEC guidance on climate change disclosure regime because it can influence regulation elsewhere and keeps the issue "on the map" and provides a place form where investors can get information that may be useful for their investment decision making. And it focuses companies on calculating the financial impact on weather related events. Carmen G. Gonzalez, Professor of Law, Seattle University School of Law— Biofuels and Sustainable Development: Challenges and Opportunities. Professor Gonzalez started with a description of the normative and standards foundations that impacts biofuels related activities and the CSR standards directly relevant to biofuels. In that context she described hard law standards of conduct ( example: proposed treaty to impose human rights obligations on corporations); alternatives to regulation (the business case for CSR), and regulation through soft law instruments (codes of conduct, social & environmental reporting and certification schemes). She noted the road to the incorporation of transnational CSR norms into hard law via Treaty, Legislation, Contract, and Norm-Applying Institutions (judicial and regulatory). Professor Gonzalez then turned to biofuels distinguishing between 1st, 2nd, and 3rd generation fuels, moving from plants that also serve as food to biofuels that do not compete with food or land that could be used for food production. She explained the boom in biofuels in the West and biofuel mandates in the U.S. and the E.U. That boom and those mandates have effects: Rising food prices; Food price volatility; Large-scale sales & long-term leases of agricultural lands in developing countries that dispossess local communities (land grabbing); Violation of human right to food; Greater greenhouse gas emissions; Loss of biodiversity; and Harm to human health. Within this context Professor Gonzalez considered the E.U. Sustainability Framework for biofuels.She offered a critique based on the failures of the framework to: (1) address human rights; (2) address indirect land use change ; (3) actively discourage the production and consumption of biofuels that compete with food production for land and water; and (4) avoid forum shopping hrough multiple certification standards. For the way forward, Professor Gonzalez noted the possibility of a global standard but expressed concern about developments in the interim and the playing off of home and host state standards. Shalanda H. Baker, Associate Professor of Law, University of Hawaii at Manoa William S. Richardson School of Law—Implementing Free Prior and Informed Consent: Expanding the Role of Communities in the Global Energy Transition.Spoke to the dynamics of norm making in the global south where issues of representation and rule makers ostensibly representing their interests confront each other. The touchstone was the narrative of a recent consultation in Mexico on the Shared Social Benefits for Energy projects, looking to wind energy to advance Mexico's green energy programs. The difficulty in this case was that the members of the group were all elite representatives and the people on whose behalf this work was undertaken was not invited. They invited themselves anyway. That created an awkward meeting but made the point (my take here). This mirrors indigenous consultations in Mexico that have tended to drag on and leave unresolved issues of representation, of protection for consultation against retaliation, and the issue of representation itself has proven problematic. The controversy surrounding Mexico’s first-ever indigenous community consultation process for a renewable energy project foreshadows future conflict in Mexico and around the Global South.Professor Baler offered the doctrine of free, prior and informed consent (FPIC)as an effective alternative means of development. With that in mind she turned to the issue of wind energy and indigenous consultation. The state of Oaxaca, the country’s second poorest state and home to over fourteen unique indigenous groups, forms the cornerstone of the country’s renewable energy strategy. Currently, the twenty-plus wind energy facilities in the Isthmus of Tehuantepec comprise 92% percent of the country’s wind energy mix.Without the meaningful participation of indigenous communities, the transition to a clean energy future will lead to lasting conflict or fail.She argued that to engage fully in new modes of development there must be a shift in three key ways. First, it requires the codification of both the substantive and procedural aspects of the doctrine within its legal architecture. Second, in order to meet aggressive renewable energy and climate change goals, attract foreign investment, and transition to a clean energy future consistent with principles of energy justice, states should use FPIC as a tool to facilitate deeper engagement in the planning aspects of energy development. Third, FPIC should be used as a gatekeeping tool for the release of clean energy certificates granted by the state. On this basis Professor Baker offered recommendations: (1) that FPIC be embedded within the legal architecture of developing countries; (2) FPIC should be used as a procedural tool to facilitate energy resource planning within communities prior to the moment of development; (3) FPIC should be seen as a prerequisite of receipt of any marketable carbon credits associated with a renewable energy project. Larry Catá Backer, W. Richard and Mary Eshelman Faculty Scholar; Professor of Law and International Affairs, Pennsylvania State University, —The Corporate Social Responsibilities of Financial Institutions for the Conduct of their Borrowers: The View From International Law and Standards. 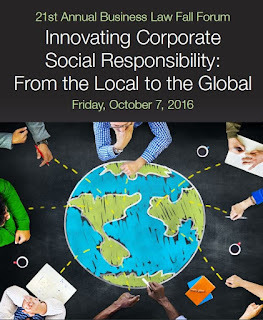 Corporate social responsibility (CSR) can be split along two distinct lines. The first touches on the nature of corporate personality and is rooted in domestic law regulating enterprises specifically and legal persons generally. The second touches on the nature of the rights of individuals and is rooted in international law (and sometimes domestic constitutional law) defining the scope of the human rights of individuals and the consequential obligations of states and legal persons. Both conversations intertwine though they tend to operate autonomously. In both cases, however, the traditional focus of corporate responsibility has focused on the relationship between an operating company and its direct effects on individuals, society and the environment. That discussion remains contentious, conflicted and unresolved. But it ignores a critical actor—the financial institutions which provide operating capital to enterprises. The presentation considered the corporate social responsibilities of financial institutions, including sovereign wealth funds, for the conduct of their borrowers. The focus was on the extent of any duty or responsibility of lenders to ensure that their borrowers comply with CSR obligations (or alternatively conforms to international human rights standards) as a core aspect of their own CSR obligations (or alternatively) of their responsibility to respect human rights. Professor Backer first examined the general regulatory framework for business CSR at the domestic level and the discursive framework of human rights in the international sphere. There are two aspects that are relevant. The first is to understand the scope and character of the legal norms that may be applied to enterprises generally with respect to their operation’s that might be understood as CSR-human rights related in nature. The second is to consider the range of non-legal normative governance rules that might apply. In the process it will be important to distinguish between a CSR based regulatory approach and a human rights based approach. He then considered the application of these norms to financial institutions. This requites distinguishing between those obligations that apply to the internal operations of financial institutions generally, and those obligations that apply to the financial institution’s obligations with respect to its lending activities, that is with respect to its relationship with its borrowers. He ended with a brief examination of recent cases in which financial institutions undertook such a responsibility, and the ways in which that obligation was undertaken. Three different types of institutions are considered—private banks, sovereign wealth funds and international financial institutions (IFIs). Professor Backer argued that these trends show a marked push for the legalization and privatization of the societal sphere. Where enterprises had once been the object of legislation and administrative regulation by states have become regulators in their own right. Soft law, no longer likely to be transposed into the law of states is being incorporated into the regulation of production chains.